Somehow this didn't surprise me. The songs she'd sung, stories she'd told, and comments she'd made suggested that Sermanni's mind is imaginative and reflective, constantly absorbing experiences and ideas, processing them into spellbinding music and lyrics. Hard to imagine her spending much time on emails or social media. It was Sermanni's third visit to Husthwaite Village Hall, both old and new. ‘I've played in this hall before; a different hall ... but the same hall', she commented. And it was quite a coup to get her back: at the age of 26, she is already much in demand. With three albums and four EPs to her name, this summer alone her live performances will range from Skye to Indiana, USA, taking in London and Milton Keynes along the way. Sermanni's songs are rooted in her experience, and she introduced many by engaging us with stories about their origins. One (I didn't catch the title) was written during a tour of northern Canada after she had seen the Northern Lights with her brother who was acting as her tour manager. Another arose from a time she spent providing coffee in a Buddhist retreat where ‘everyone was very calm and Buddhist, until they wanted their coffee'. A third, ‘Jen's Song', from her 2016 EP ‘Gently', was about her long-time friend Jennifer Austin (who played beautiful, restrained piano on many of the songs during the evening) and included the lovely tribute: ‘I hope your mother knows:/I'd be proud if I gave birth to one of those'. Rachel Sermanni's voice is haunting and soulful, her melodies often meandering and unpredictable, and her chord sequences unexpected. Although she sometimes performs with a small band, this evening her accomplished guitar and mandolin playing - sometimes subtly supported by Jen Austin's piano - provided a perfect accompaniment to her velvety vocals. The sound quality was superb, thanks to Mike Wells' skills as a sound engineer and the hall's excellent equipment and acoustics. Between songs, Sermmani quickly established a rapport with her audience. She has a self-effacing charm and quiet wit which endears her to you. Introducing her song ‘Tractor', she commented: ‘I bet you have some lovely tractors around here'; later she mentioned the ‘unique' experience of attending the Tholthorpe pantomime during a previous visit to the area; and approaching the end of the evening, she coyly announced that she and Jen would ‘hang around the merc [merchandise] table ... for no apparent reason'. Earlier, the evening had got off to a magnificent start thanks to the support act: Easingwold writer, actor and musician David Jarman (known to many through his work with Gobbledigook Theatre). Accompanying himself on a multi-coloured ukulele - which he plays with a most distinctive style - David's self-penned songs ranged in subject matter from being bumped off an overcrowded plane to ‘everything I learned about being an adult in 2016', to which he added, ‘It's a very short song'. 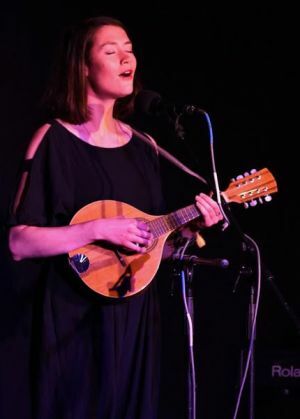 With Rachel Sermanni's appearance, Husthwaite Village Hall took another step on the way to establishing itself as a hub for the arts in the Vale of York. Those, like me, who saw this show will certainly be hoping that she makes a return visit before too long. In the meantime, we have another appearance by legendary saxophonist Snake Davis and his band to look forward to on 7th October.